Bunny cake is a hot favorite for any kind of parties whether it is a birthday celebrations or an Egg Hunt for an Easter Party. Get a bunny cake diagram picture and cut one pound of your cake as per the diagram. Leave the other face as it will be used to make the face. Place the cake which is uncut on a cake dish or you can take a card board and wrap it neatly with butter paper or foil. Now place all the pieces which are cut as per the diagram you can use some whipped cream to sick the pieces together. Put the flake coconut in a bowl and put few drops of red color and mix it well with the coconut color can be added to get the shade you want. For this you would require one fourth coconut from the tin. Now cover the entire cake with the whipped topping smoothly and then sprinkle all the flake coconut over the topping. 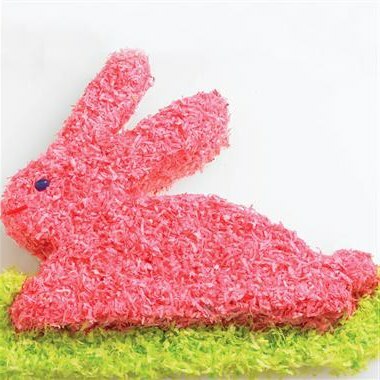 Then at the center of the ears of the bunny sprinkle the pink coconut. The tie and bow of the bunny can be made with candies. Eyes nose whiskers can be done with the help of different shape and different colors. You can go ahead and be creative. You can have the bow tie of any color you want. Or if chocolate is your favorite, you can use this instead of the coconut!